A convicted fine-wine faker is going to prison, but no one knows yet exactly for how long — in part because no one knows exactly how many millions he took from his rich-and-famous victims. In a spectacular fall from grace, Rudy Kurniawan, 37, went from being one of the world's most respected collectors of aged and premier wines to being found guilty last year of fraud for selling counterfeit wines and defrauding a finance company. In closing arguments, prosecutors said they had overwhelming evidence that Kurniawan concocted millions of dollars' worth of phony wines in his Arcadia, California, kitchen. 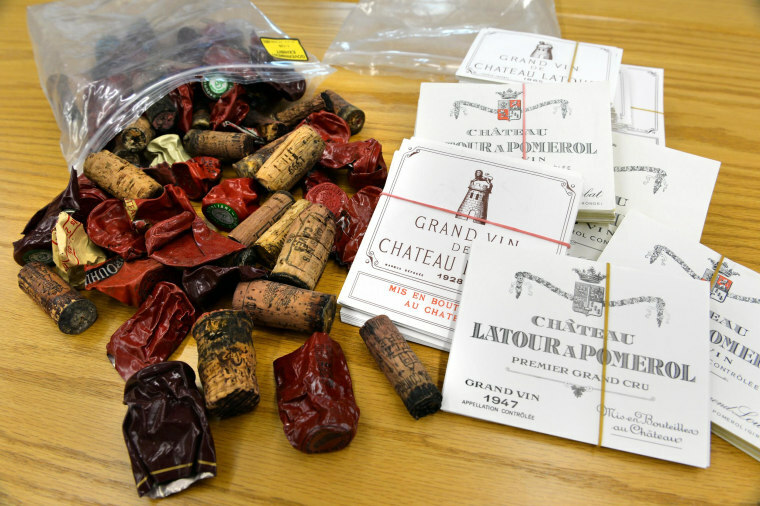 "The magic cellar is where Rudy Kurniawan, the defendant, said he found the amazing stash of wines so rare and so great that they were the stuff of legend," said assistant U.S. attorney Joseph Facciponti in a New York City courthouse in December 2013. "There was just one problem: There was no magic cellar." Kurniawan was supposed to be sentenced Thursday, but his sentencing was postponed because Federal District Judge Richard Berman wanted more information from attorneys, particularly from federal prosecutors, who have asked for a financial judgment of $20.7 million — along with at least 14 years of prison time. Lawyers on both sides are unable to say exactly how much fake wine Kurniawan sold, in part because only one of his victims, billionaire William Koch, has come forward and documented how much he believes was schemed out of, Kurniawan's attorney said. "Part of the problem is, Mr. Kurniawan spent $40 million buying wines [between 2004 and 2011]. We've documented that that is the case. And then he sold a lot of wines. And the government is essentially trying to say that virtually everything he sold was counterfeit," said defense attorney Jerome Mooney. But, he added, Kurniawan has $3.4 million worth of wine left in his warehouse, leaving about $36 million worth of wine unaccounted for. "Everything he sold couldn't have been counterfeit. A big part of it couldn't possibly have been counterfeit," Mooney said. Prosecutors feel differently. In a letter to the judge, they argued there is "reliable evidence" that Kurniawan earned millions more from his scheme, "above and beyond the $20,730,000 that the government seeks in forfeiture." Corie Brown, a wine writer and former reporter for the Los Angeles Times who interviewed Kurniawan in 2006, said Kurniawan was known for always sharing expensive bottles of wine at tastings, and because he had bought so much wine himself without checks bouncing or any other red flags, everyone in the wine world trusted him. "The people who were close to him were all people who had made a lot of money selling him a lot of wine, or were being paid by him when he set up a wine shop in LA," she said. "Nobody wanted him to not be real. And now no one wants to say 'I'm an idiot.'" In a hearing Thursday morning, the judge asked for more clarity on the amount of restitution Kurniawan owes before the sentencing, which has been rescheduled for July 17. Mooney argued that while the money involved in the scheme sounds like a lot to the average person, in the high-rolling community of fine wine purchasers, it's not enough for most people to file an official complaint. "In the world of most of these people, this isn't a big thing," he said. Kurniawan, who was born in Indonesia and is of Chinese descent, was once one of the top five wine collectors in the elite world of world of fine vintage wine, according to AFP. Through sales at auctions and directly to collectors, he sold more than 1,000 fake bottles that he blended in his kitchen on the outskirts of Los Angeles. He had his first experience with fine wine at a birthday celebration for his father in 1999, and shortly after that, began buying wines of increasing quality and price. When he was just in his early 20s, he became known as a prodigy for his sophisticated palate. In her 2006 Los Angeles Times article, Brown profiled Kurniawan, his expensive dinner parties, and his collection of cars — a Bentley and a Ferrari were among them — along with his aspirations for continued success in the wine business. In a pre-sentence filing, Kurniawan's attorneys said their client's wine-buying had become "almost compulsive" by 2003 and said he was drawn to selling counterfeit wine because expectations had risen so high about the wine he had, and he wanted to keep the friends he had made through his wine business. "Bringing extraordinary wines brought acceptance and recognition," the filing said. "Rudy liked the feeling of being the center of attention. It gave him a feeling of achievement and belonging that he had never before experienced." The filing went on to say that the best night of Kurniawan's life was a tasting he had hosted that actor Jackie Chan attended, in which Chan "stood on a chair and applauded Rudy." After being exposed to so many rare wines, Kurniawan realized that he could blend other ones to reproduce the taste. He started mixing wines and then reproducing the bottle and label, too. "It was a challenge, and he was up for it," the court filing said. "He had a printer in Indonesia who created authentic reproductions of labels and stickers. Rudy also ordered stamps and authentic wax to mark and seal the bottles." He did slip up once in 2008, when fake bottles of France’s Domaine Ponsot were identified at a New York auction. Kurniawan was arrested in March 2012, and has been in custody since then. His lawyer argues that he should be released on the time he has served.